Adobe Photoshop is the undisputed industry standard, so much so that it has become a verb, "to Photoshop". However, for an amateur or a startup freelance Graphic Designer, the cost of a Photoshop license or subscription can be prohibitive. 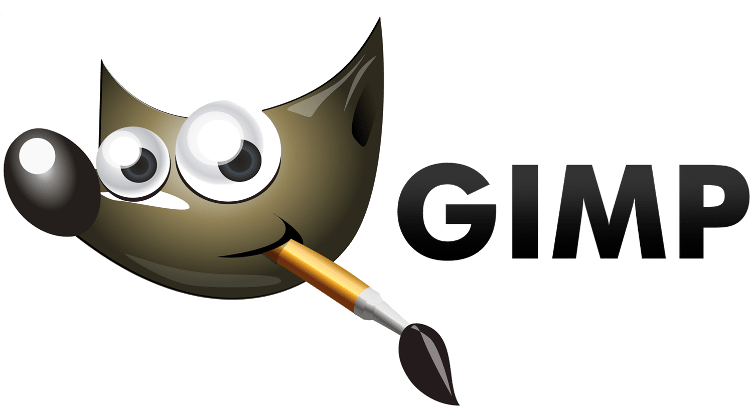 GIMP is an open-source Photoshop alternative that is 100% free. 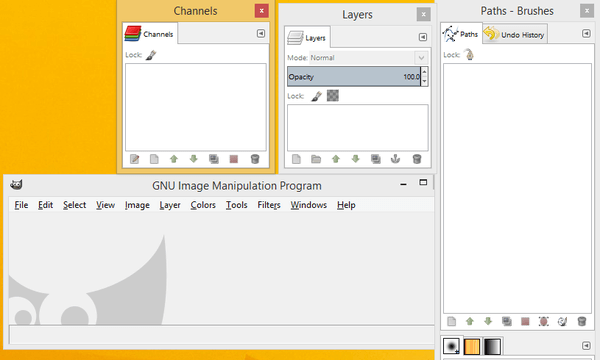 GIMP (GNU Image Manipulation Program) is a free and open-source raster graphics editor, available for all major platforms: Linux, Mac OS X, and Windows. 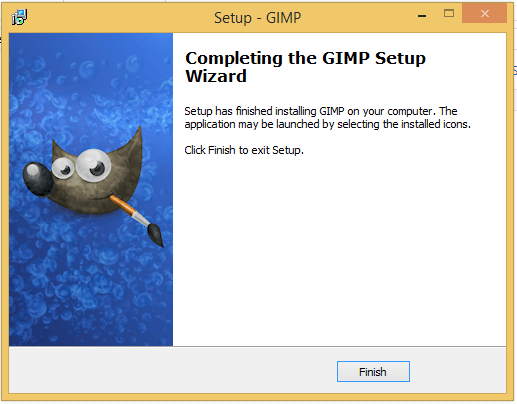 GIMP can be used for image retouch and editing, resizing, cropping, layer management, color management, free-form drawing, and we can also add extra abilities with extensions, such as the Animation Package and Paint Studio. Since Adobe Photoshop is only available for Windows and Mac OS X, Linux users consider GIMP their version of Photoshop, and a better alternative than loading up Photoshop on Wine. It should be clear, though, that GIMP's creators aren't aiming to replace Photoshop. It is a program with its separate audience; it isn't chasing after Adobe's creation. That said, for an amateur or a beginner freelance designer who can't afford or doesn't want to pay for Photoshop, GIMP is probably the most powerful solution right now. The easiest way to download the latest version is using a torrent client, such as qBittorrent or BitComet. If we don't have and don't want to install a torrent client, we can always click on the alternative "this link" that starts an HTTP download. The size is less than 90MB for the current version 2.8. 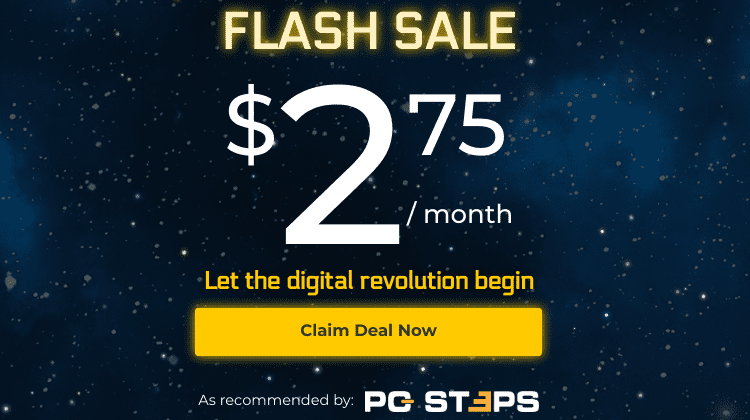 The installation is straightforward, with no toolbars, browser hijackers, or other unwanted apps. 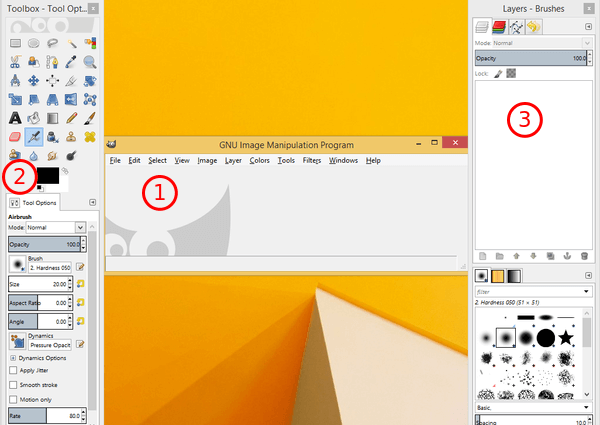 On the first run, GIMP opens the main program Window (1), a toolbox windows with most of the program's tool capabilities and their settings (2), and a panel that includes windows for Layers, brush sizes, channels, paths, and history (3). Of course, we can re-arrange the panels to create our own, personalized workspace. A valid criticism for GIMP is that it has a somewhat steep learning curve. A person that has never used a Photoshop-level program is thrown into the deep end with GIMP. It is a rich and complex program, that has way more options than a beginner can handle. 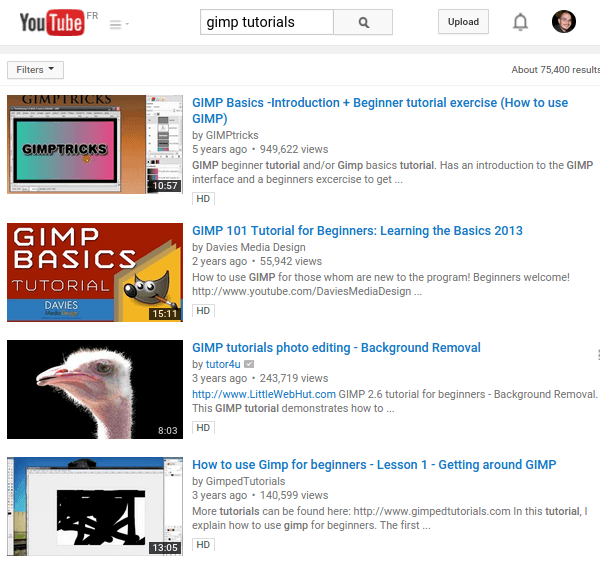 It's good that there are plenty of tutorials available on the Internet. For people familiar with Photoshop, they will find similar menus on GIMP, with a few differently placed options, and a large percentage of Adobe's functionality. 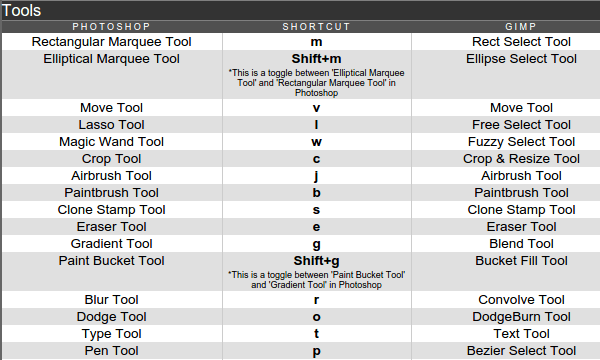 What is tough in this case, though, is that most of Photoshop's keyboard shortcuts won't work on GIMP. Pressing Z will activate the zoom tool, but S won't select the clone stamp, but the smudge tool. L won't open the Lasso, but the blend tool. Keyboard shortcuts are crucial to a professional, as they are faster than clicking every tool or sifting through the menus. So, somebody who was trained or worked extensively with Photoshop will be in trouble. They will have to re-learn all the new keyboard shortcuts of GIMP, to reach the same level of expertise. In any case, there is an informal way to replace GIMP's shortcut scheme with Photoshop's, using an alternative menurc file. What's surprising is that changing the shortcuts was a conscious decision of the development team, even though the did consider using Photoshop shortcuts for a while. Back in 2011, Alexandre Prokoudine, who has worked on the development team of GIMP, said on ubuntuforums.org that he had created a file that matched Photoshop CS4's shortcuts. During the 2.7 dev cycle, however, they decided to get rid of that file. The basic explanation he offers in the same thread is that the two apps "are two different mindsets". So, apart from the unofficial workaround, it's doubtful GIMP will ever get integrated Photoshop shortcuts. Apart from the shortcuts, which is easily solvable, there are some things a professional used to Photoshop might miss. 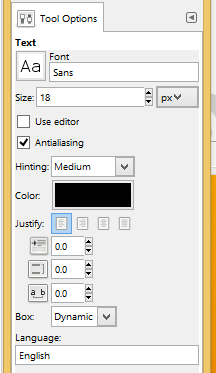 Text input is basic, compared to the effects and transformations Photoshop offers. Photoshop's Adjustment Layers, are a lightweight way to make non-destructive changes in pictures. In GIMP, we need to create a complete image layer to apply a new filter without touching the original image, and change the layer's opacity or blend mode to get the result we want. We won't find 3D commands in GIMP, like those found in the Extended and Creative Cloud editions of Photoshop. There are however some Generic Graphics Library (GEGL) scripts that can perform similar operations. GIMP's support for scripting is much wider than Photoshop's. We will find, of course, an undo function, but nothing like Photoshop's History and the History Brush, so it's harder to backtrack on any possible mistakes. For professional photographers, the fact that GIMP doesn't include built-in RAW processing might be a deal breaker. Anyone working with RAW files must download a converter such as UFRaw. UFRaw is an excellent converter that even has some of the Adobe Camera Raw capabilities. Even so, it is an extra level of complexity, having to use two separate programs to have full RAW support. Heavy plugin users on Photoshop will have to forget their plugins on GIMP. There is no planned support for Photoshop's plugins, and there probably never be. Of course, GIMP comes with plugins of its own. 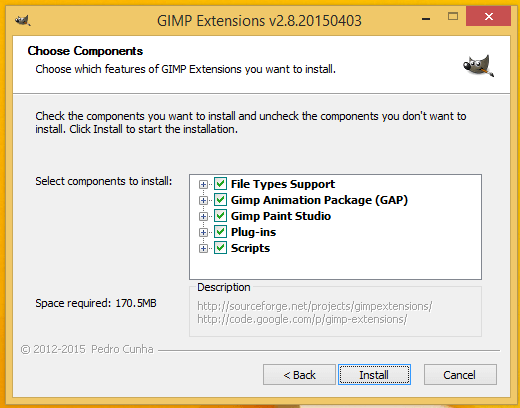 We can even use the GUI tool Extensions Pack to select, download, and install the available plugins. There is not much of a dilemma. If you are a professional graphics designer and can afford Photoshop or the CC subscription, there is a reason it is the industry standard. If you are a home user, however, and want to get Photoshop to "have the best", you are way better off with GIMP. For all the basic image editing, GIMP is just as good, it's legally free, it doesn't need as many resources, and it isn't riddled with malware like a torrented Photoshop might very well be. Did you give GIMP a try? Did you like it? Leave us a comment with your opinion.